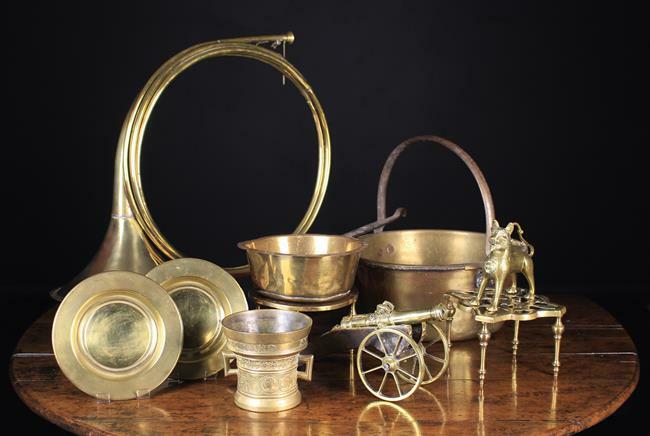 A Collection of Brassware: A coiled hunting horn, a ornamental miniature cannon on carriage, a 17th century style mortar, a 16th century style aquamanile, a 19th century kettle stand with pierced quadrifom top plate, a late 19th/early 20th century jam pan, a trivet with round top plate, a sheet brass pan with iron handles, and two round plates. A Group of Miscellaneous Pottery. 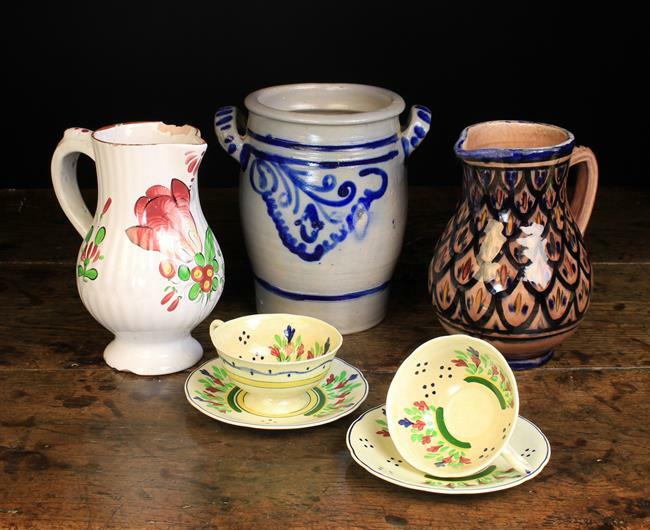 A French Lunéville Faience Jug; the fluted baluster body decorated with pink flowers, 8¼ in (21 cm) in height, a Moroccan jug, 8 in (20 cm) in height, a pair of hand-painted cups & saucers and a Rheinish Grey stoneware storage jar with twin handles and blue glazed decoration. 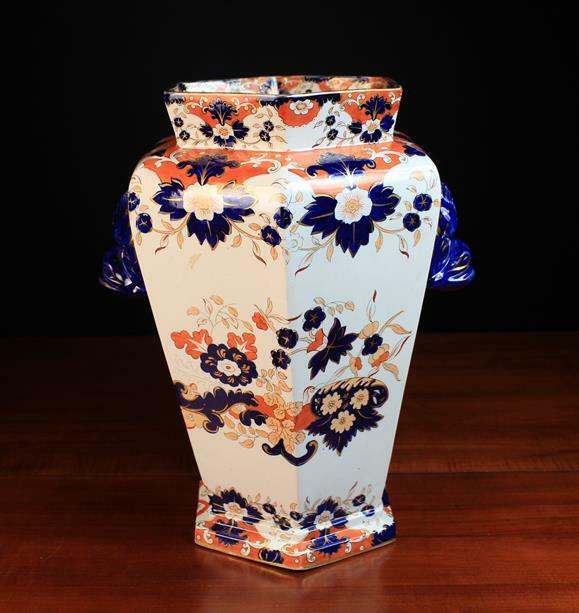 A Large Alcock's Indian Ironstone Vase of hexagonal form decorated with flowers in deep rich blue with orange overglaze and gilding, and having moulded mythical beast's face-mask cup handles either side and impressed mark to base, 17 in (43 cm) in height. 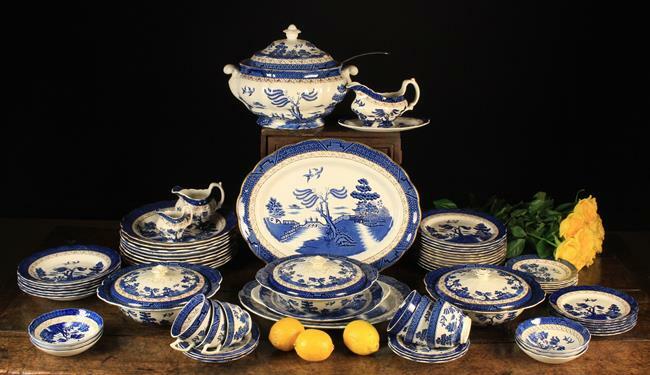 A Booth's Blue & White 'Real Old Willow' Dinner Set comprising of six cups, saucers, side plates, bread & butter plates, bowls, 12 breakfast plates, 11 dinner plates, a serving plate, 3 lidded tureens, 2 graduated oval platters, a lidded soup tureen, sauce boat on stand, and two graduated jugs. 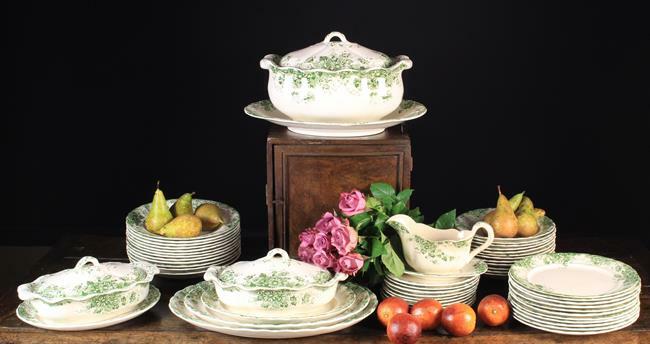 A Late 19th/Early 20th Century Barkers & Kent Ltd 'Coburgh' Dinner Service transfer print in green with asters and foliage and comprising of 11 dinner plates, 10 side plates, 11 soup plates, 12 bowls, 4 graduated oval platters, a large soup tureen on stand, two lidded tureens, and a sauce boat on stand. A Good 19th Century Staffordshire Loving Mug. The interior harbouring three small amphibians: two frogs & a lizard, with black spotted markings. 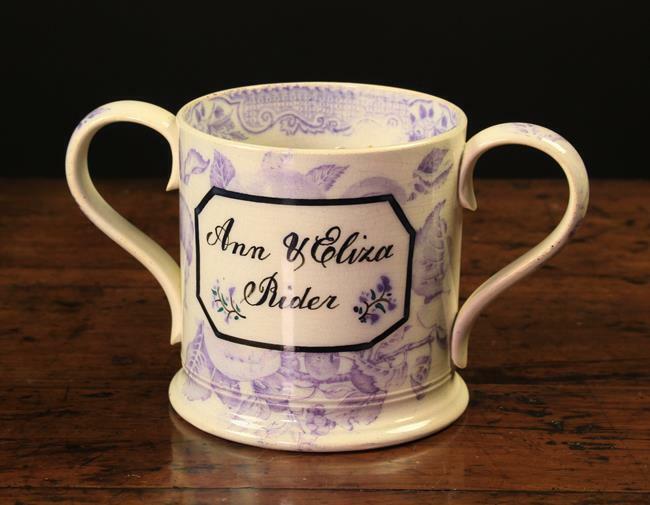 The exterior having a label to one side inscribed in black; 'Ann & Eliza Rider', with a panel of verse to the other side; 'A friend that is social, goodnatured & free, To a pot of my liquor right welcome shall be, But he that is proud & ill-natured my pass, By my door to an alehouse & pay for his glass'. The cylindrical body transfer printed in lilac with fruiting boughs. 5 ins (13 cm) in height. 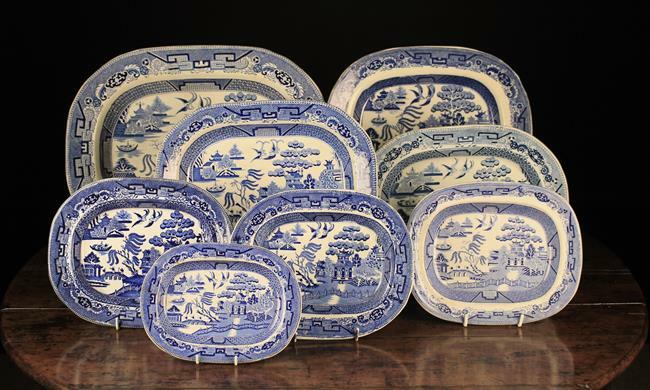 A Collection of Eight 19th Century Blue & White Willow Pattern Plates; various makers and sizes ranging from 8¾ in x 6½ in (22.5 cm x 16.5 cm), to 18 in x 14½ in (46 cm x 36.5 cm). 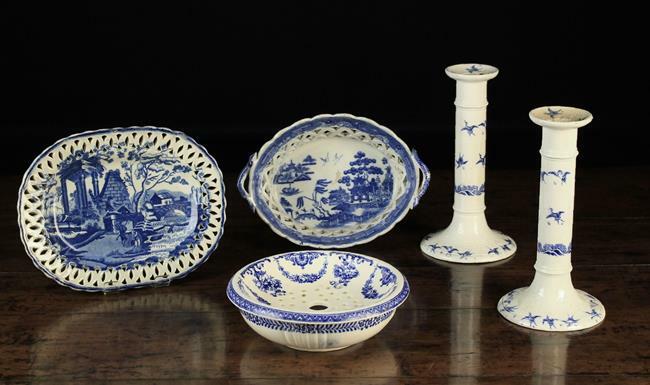 A Collection of Antique Blue & White Transfer Printed Ceramics. 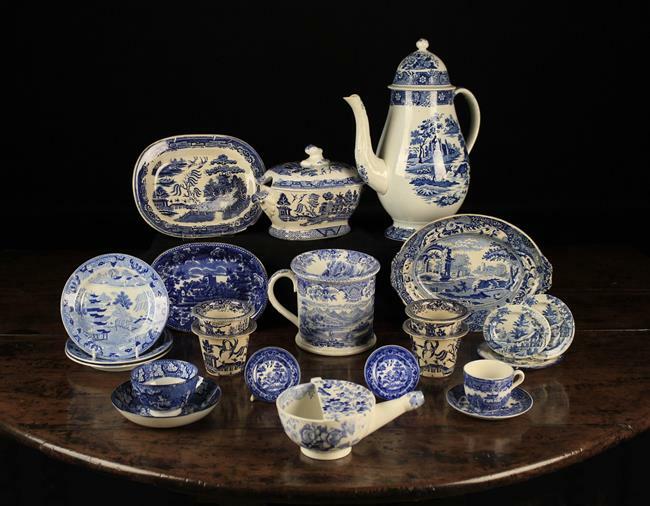 To include a Regency baluster coffee pot and lid, 10½ in (26 cm) in height, a sauce tureen & cover, a charming Georgian pearlware teabowl & saucer, four willow pattern potted meat pots by Maling, a mug with funnel decorated with Northern Scenery; Kilburn Castle Lock Aux, a spouted invalid mug, etc. 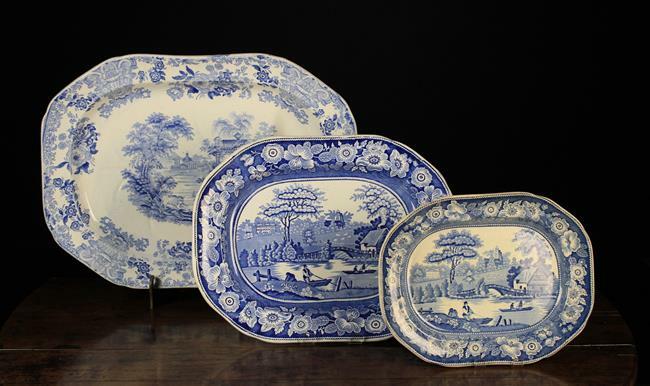 Three 19th Century Blue & White Transfer Printed Meat Plates: Two printed with Nuneham Courtenay in 'Wild Rose' borders 10 ins x 13 in (25.5 cms x 33 cm) and 13 in x 16½ in (33 cm x 42 cm). And a large meat platter with jus reservoir decorated with cattle resting by ruins in landscape, 16 in x 21¼ in (41 cm x 54 cm). 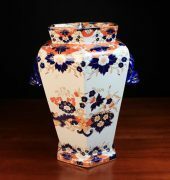 A Group of Blue & White Transfer Printed Ceramics: A Pair of Minton Blue & White Candlesticks printed with ''Japanese Crane'' decoration, 8¾ in (22 cm) in height. A Wedgwood 'Galatea' Etruria soap dish with drainer. A 19th century pearlware basket printed with willow pattern (A/F). And a small oval platter with pierced border framing a classical landscape, attributed to Thomas Lakin, Circa 1815.